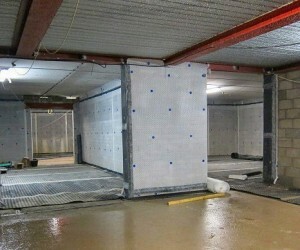 A recent small accident, on one of my basement waterproofing jobs highlights a health and safety risk, which may be underplayed on these projects, particularly on new build basement waterproofing sites. During installation of a pumping station in a new-build basement, a small jet of water from the slab squeezed under our technician’s eye protection. He immediately suffered searing pain. The eye wash station was to hand and within a minute or so his eye was washed clean and the pain was relieved, though he was in some discomfort for a day or so. Fortunately there was no lasting damage, though his eye was bloodshot for a couple of days. This was reported and logged of course. But it got me thinking….. This was not what we’d normally call a high risk activity, and of course a risk assessment and safe system of work was in place so, what went wrong? The technician was using a breaker to cut through the slab to install a sump, so of course he wore his gloves, boots, and ear and eye protection too. So how come he was injured? It comes down to the perceived risk. He and we imagined the hazard was one of flying debris such as pebbled and grit blown up from the tip of the breaker. With this in mind the technician wore high impact glasses, which of course have a slight gap around the edges, though the eye itself is covered. A jet of water hit his cheek and was deflected upward into the eye. Had he wore close fitting, albeit less comfortable tight fit goggles, or doubled up with a visor over the glasses, he would probably have been fine. He didn’t do this because a splash of water in the eye is not something guys would normally worry about, unless they were mixing concrete or cement grout. The missing hazard is the PH of the water on and in contact with the new concrete slab. Following the incident I asked for some samples of the water in the sump to be brought back to the office. On testing the sample (clear water with white lime sediment at the bottom), I found the PH was about 11. 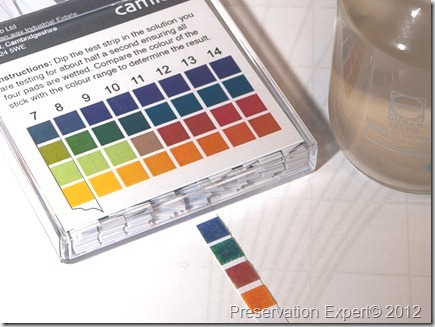 Bear in mind that water is neutral at a PH of 7 and gets acid as the number falls and Alkaline as it rises. The scale is a logarithmic one and the PH increases by a factor of ten for every step – so PH 11 is ten thousand times more alkaline than a PH of 7! Okay, so fresh cement can have a PH of 12 or 13, but this concrete has been hardened for months. To put this in perspective 11 is only one step below Ammonia. Now, would you wear simple high impact glasses if you were working ankle deep in Ammonia? For fun, I tested a couple of items under my own kitchen sink and found these were all lower than the lime scale basement samples, except neat bleach, which came out at 13. Alkaline burns to the eye are more harmful than corresponding acid burns, hence the bloodshot eye and pain involved. Bases cause emulsification of the fats and oils in our skin and mucus membranes including the eye surface, so the contaminant soaks in quickly and strips the cells of protection; a process known as saponification (the process where caustic fluids are used to make soap). This is why such water feels slightly soapy to the touch. That feeling you get is made by the reaction between the liquid and the oils and fats in your own skin – it’s making soap from you. After wetting, skin feels very dry and ‘raw’, which is exactly what it then is – and it is much more susceptible to damage and disease thereafter. I’ve now modified my risk assessments to include this hazard and have changed our safety method statements to take it into account on basement waterproofing and allied work. I’ve written to each of my staff and wrote this for any of my pals working in the basement waterproofing field. A toolbox talk on the use of correct PPE with this in mind is scheduled for the new year. Having just sat my NEBOSH I can wax lyrical on the regulations which apply, but what really matters is keeping us all safe – including the interested customer, who may want to peer over a technicians shoulder as he services a pump, or play with the float switches once we’ve left site…. watch out! Interesting stuff Bryan I would never have thought that. Thanks for looking in. I never thought of it either, which is why I thought a heads-up would be useful. Ideally we need to share any incidents between PCA members so that we all benefit from others experiences, hence the post on the PCA linkedin group. I’ve had a really good christmas and not done any work, but I’m getting a bit itchy now….. This is an interesting piece and as you say, not necessarily shows itself as being the risk that it is. It is always unfortunate that sometimes it requires an injury to highlight a risk, fortunately it seems in this case at no long term damage. It would be nice to see more blogs showing all sides of our industry whether positive or negative for the greater good. It was a suprise to me that the water could be so alkaline. I hope the lessons we learned spread through the basement waterproofing industry to improve safety standards. The next issue is the biological hazards of water in older, maybe sewage contamnated basements – hepatitus anyone? Good cause – how you doing – still dry? Its the 2nd after all! Oh you got me Steve! 110 Volt centre tapped to earth…. the shame!!!! Still dry… already saved a tenner for cancer research!